A product of powerful thunderstorms, a tornado is one of nature’s most devastating storms. It can wipe out an entire neighborhood and cause multiple fatalities within seconds. A tornado can directly cause injuries, but people can also get hurt after the storm, when walking among debris or into damaged buildings. 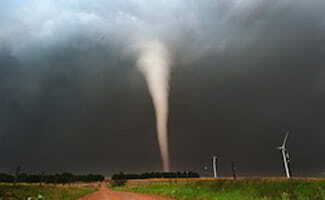 A tornado appears as a rotating, funnel-shaped cloud extending from a thunderstorm to the ground, and it can strike quickly, with little or no warning. Some tornadoes are clearly visible, while others can appear almost transparent until dust and debris are picked up or a cloud forms in the funnel. The average forward speed of a tornado is around 30 miles per hour (mph), but can range from 0 to 70 mph. Funnel wind speeds can reach 300 mph, but the wind may die down and the air may become very still before a tornado hits. Tornadoes that form over water are called waterspouts and can accompany tropical storms and hurricanes as they move onto land. Peak tornado season in the Southern states is typically from March to May, and in the Southern Plains it is from May to early June. Tornadoes usually occur on the Gulf Coast throughout the spring. In the Northern Plains, Northern states and upper Midwest, peak season is in June through August. Tornado Alley is a strip of land covering the northern region of Texas, Oklahoma, Kansas, Nebraska, Iowa, East Colorado, Southwest South Dakota and Southern Minnesota. Tornadoes in this area usually occur in the late spring. Understanding tornado safety is especially important in these specific regions. Visit our Disaster Preparedness Plan page to learn more about Hurricane Safety, Thunderstorm Safety, Fire Safety Tips and developing an Emergency Evacuation Plan. Also consider preparing a 72-hour kit to add one additional layer of safety for you and your family.